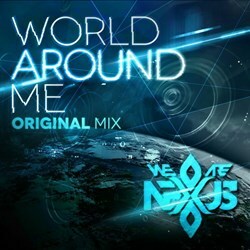 As (We Are) Nexus prepares for the release of their new single “World Around Me” on January 28th, the original mix of the much expected track is already receiving significant rotation at prominent dance radio stations such as Music Choice EDM, Dance Factory Chicago and Fusion Radio to name a few. Immediately following the groundbreaking release of their first single “It Feels So Good,” EDM act (We Are) Nexus were hard at work back in the studio creating their original track and follow up release "World Around Me." As any successful musical act can attest, Nick Gunn and Carmen Rainier, the creative forces behind the EDM duo, had their noses to the grind stone producing a fresh and provocative dance track for their fans and newcomers alike. “World Around Me,” the title of their new single, is highly anticipated by the EDM industry with a street date this upcoming Tuesday, January 28th. As the street date rapidly approaches, “World Around Me” has already hit the airwaves of respected dance music radio stations such as Fusion FM, Party 105 FM and Music Choice EDM. Music Choice is the premiere satellite broadcasting company for music programming available on cable television in the United States. This month (We Are) Nexus was added into heavy rotation on the Music Choice Dance/EDM channel with their single “World Around Me” (Original Mix) keeping company with current EDM icons such as Krewella and Avicii. It was just last week when Nexus’ debuted on the Music Choice Dance/EDM channel and their single “World Around Me” (Original Mix) has received an impressive 43 spins per week. On any given day, Nexus reaches 54 million households through the Music Choice Dance/EDM channel, which provides serious momentum leading up to official release date of the "World Around Me" album on January 28th. "World Around Me” is the second Nexus single that Fusion Radio FM, the #1 online dance radio station in the nation, that has been placed into heavy rotation before its official release date. “It Feels So Good,” Nexus’ breakthrough single, was immediately well received by Fusion Radio listeners and continued to impress the dance community as it topped the Billboard and iTunes dance charts. As “World Around Me” penetrates deep into the airwaves of dance stations throughout the nation and gains new listeners on Fusion Radio, fans are eagerly anticipating a solid release for the full album on January 28th which includes 14 remixes plus an original and extended mix of the "World Around Me" single. It goes without saying, that the buzz “World Around Me” is getting prior to its release is a sure sign that (We Are) Nexus has not hit a sophomore slump and activity continues to grow for the EDM duo. The most recent reports on the prominent radio station monitoring service Mediabase show that “World Around Me” has already reached a #122 rank on the overall Top 40 charts and a #219 rank on the Rhythmic charts. Nexus radio promoter Mike Rizzo says "I haven't seen this type of radio action for an indie act in years. This is a great sign and we will keep working this single to the top." (We Are) Nexus’ second single “World Around Me” will be released on January 28th and will include 16 tracks inclusive of remixes from EDM's brightest players that will be sure to get your blood pumping. The single is already climbing the radio charts and has been permeating the airwaves through Music Choice Dance/EDM, Fusion Radio and other various radio stations across the nation including Party 105 FM and Dance Factory FM Chicago. If you dig the Nexus sound, join the movement and follow (We Are) Nexus on Facebook, Twitter and Youtube for updates on the “World Around Me” release and more.